For a limited time, coupon code PREZDAY60 gets you a 60% off discount on classes and courses at the Stacksocial website. The physical goods (eg consumer electronics) are NOT eligible for the coupon for obvious reasons. If you are not sure whether something would qualify, their shopping cart is the ultimate decider. I believe a Stacksocial account is needed to test the coupon in their shopping cart. Speaking of which, they are offering the Ivacy VPN: Lifetime Subscription + NAT Firewall for $40 as a one-time lifetime fee. You can login with up to five devices at the same time. For a limited time, coupon code MADMARCH10 gets you 10% off various items at Stacksocial. Not everything is eligible for the coupon. Among the eligible items is the popular Zoolz Lifetime Cloud Storage service dropping from $50 to $45 after coupon. This gets you 1TB instant vault and 1TB cold storage. You only pay once (this time) and have lifetime access to the service. This is for new customer only and offers cannot be stacked per account for more storage. You can make backups from two devices (you can change them as time goes by). You can restore the backups from other devices in addition to the designated two. You can use the search box over there to look for topics of interest, eg photography, Adobe, Photoshop, etc. If you have need of VPNs, and prefer lifetime subscriptions instead of annual, two of the top three Best Sellers at Stacksocial are lifetime subscription VPNs. The Stacksocial Pay What You Want Photography Bundle gets you two photography classes with $1 or more: “DIY Food Photography” and “Advanced Creative Photography Skills”. They are about an hour each. Or if you meet or beat the average of around $14, you get an additional five classes (Portrait Masterclass, Travel Photography, Black and White in the digital age, and Become a Better Photographer two-parter), along with two sets of photography assets (pictures to practice on/with). There is a slide-show with details on each class over there. It is back for Mac OS fans! It is the latest incarnation of the The 2018 Mac Essentials Bundle at Stacksocial going for $20 featuring ten MacOS apps. Of photography interest, they have the Movavi Photo Editor by Golden Software. Other software include “Flip PDF” (turn PDFs into digital flipbooks), Concealer (no, not a retouching app, but hide/encrypt files), anti-malware subscription, duplicate files finder, uBar 4 dock, HoudahSpot 4 file finder, 2-year Cargo VPN subscription, BusyCal3 calendar and a classic game. On the “learnings” side of things, Stacksocial is offering the Photography Masterclass: Your Complete Guide to Photography by “Video School Online” for $20. It consists of 13 hours of content in 175 lessons, outlined in the product description over there. This offer lifetime access via streaming to the class. They offer a 15-day satisfaction guarantee (you get a store credit refund if you don’t like it). Stacksocial also offers a handful of Pay What You Want bundles, including two general photography bundles, and an Adobe CC bundle, among others. Another crowdfunding success story, the Alpine Labs Spark Camera Remote is currently on sale for $59 at Stacksocial. If you join their email list as a first time customer, you get a 10% off coupon. There are four different cable option bundles. You can check the camera compatibility to see which cable works with which cameras. Exclusions apply as usual, void where prohibited, etc, etc, etc. To celebrate Valentine’s, Stacksocial is offering 15% off site-wide using coupon code 2018VDAY15 entered over there. They have a mix of software, hardware, and classes, including various photography and Adobe/Photoshop type of classes. You can use their search-box over there to search for topics of interest, or navigate their categories, or check our previous Stacksocial posts for ideas. If you like the idea of VPNs with a lifetime subscription instead of an annual subscription, coupon code PRIVACY15 drops the price of the Disconnect: Lifetime Premium Subscription from $49 to $41.65 at Stacksocial. They also offer 1-year and 3-year subscription options (instead of lifetime) for $19 and $29 respectively (before coupon, around $16 and $26 after coupon). If you are a fan of using VPNs, Stacksocial is having a new 25% off VPNs coupon promotion using promo code SECURITY25 in the shopping cart there. You can test the coupon without logging-in or signing-up for an account. As to what, when, where, and how to use VPNs, that’s a whole blog in its own right. NOTE: some of these may be eligible for coupon code CYBER40 that is 40% off select software/app-related items. Black Friday is here and for Friday only, Stacksocial is offering 20% off on almost everything on their website using coupon code BFRIDAY20 over there. Some exclusions may apply. MacOS user bundle up time. Stacksocial is offering their Black Friday Mac Bundle for $39 with digital delivery (not boxes by mail). A total of eight titles are included: Roxio Toast 16 Titanium, Art Text 3, PDF Expert 2.2, Default Folder X 5, WALTR 2 for Mac, Flux 7, Stylizer 7, and MacReviver. 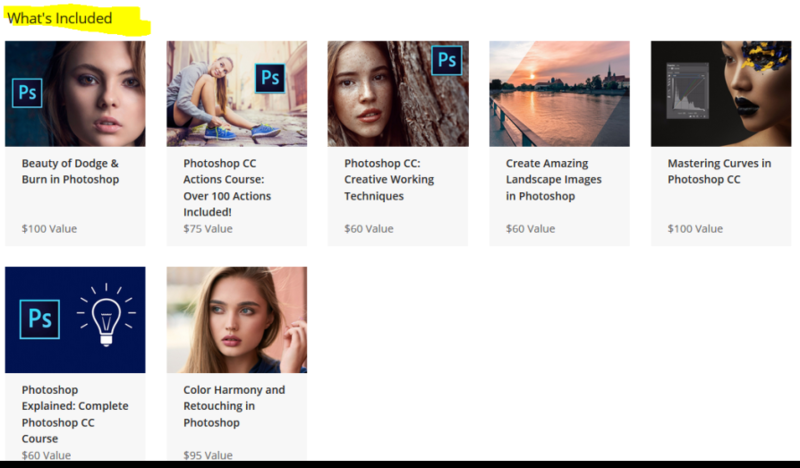 As always, Stacksocial has various Pay What You Want offers, along with a variety of Photography and Adobe related classes and offers. Speaking of Stacksocial, they are offering a Pure VPN Lifetime Subscription for $70. You pay once, and you have lifetime access to the service. You can connect up to five devices at the same time. It seems to average 4 out of 5 based on 4280 star ratings over there. They don’t have detailed star breakdowns like Amazon. Among the currently running Pay What You Want offers at Stacksocial they have one running that is Adobe CC themed. It is the Pay What You Want: The Adobe CC Lifetime Mastery Bundle. If you pay $1 or more, you get two free classes. But if you meet or beat the current average of $9.82, you get all nine bundles. The nine-course bundle includes two classes on Photoshop CC. This bundle covers a variety of Adobe CC software. They offer lifetime access. Details on each class in the slide further down the page over there. For ideas on what to look for at Stacksocial, check our previous round-up. As usual, some exclusions and limitations apply. We haven’t done one of these in a while, so it’s time for a Stacksocial round-up! Lens-shaped coffee mugs have their own variations on a theme. For example, some of them are self-stirring like this one, going for $13 and powered by two AAA batteries. This looks like a variation of the more common “24-105” type of a cup. It’s not just Mac software bundles at Stacksocial. They also have Windows 10 software bundles. The ten software title Premium PC Power Bundle goes for $29 and includes among others the Corel Paintshop Pro X9 software. Most of the other apps are computer security and utilities, along with a speed-reading class. All these are digital redemptions. To celebrate Cinqo de Mayo, limited time / limited redemption coupon code FIESTA10 gets you 10% off at Stacksocial. Most items are eligible but there are probably some exclusions. You can try it on the previously mentioned self-stirring cup or the various Adobe training classes or other photography-related items. I don’t know if it works on the Pay What You Want bundles since you can already pay what you want. Stacksocial is back with another educational promotion, they are offering a prepaid 5-year subscription to the Polaroid University Video Classes for $25. This is a one-time payment that gets you five year access to their online classes, which you can watch via a web browser or their iPhone app. You can see details and previews at their website. If you instead prefer a shorter term, a 1-year subscription is available as either a digital download or a gift-box delivered by mail for $20 through Amazon. Pay attention to the listing – download vs box. Stacksocial is offering the Complete Adobe Suite Mastery Package featuring 135 e-courses on a variety of Adobe products and topics for $79. These are offered by “eCourses4you” and are online classes. This is of general Adobe learning interest, not photographer-specific. Also in progress at Stacksocial is the Black Friday Mac Bundle 2.0 featuring nine software titles for the Mac for $20 total as digital downloads, including Corel’s AfterShot 3 (not the PRO version). Stacksocial launched their Black Friday Mac Bundle 2.0 featuring nine software titles for the Mac for $20 as a digital download. This includes Corel’s AfterShot 3. As far as I can tell, this is not the PRO version. Other titles include Particle Shop, Crossover, PDF Expert, Total Video Converter PRO, etc. Check under the Specs of each title to see if it’s compatible with your current version of MacOS if you are running an older version. 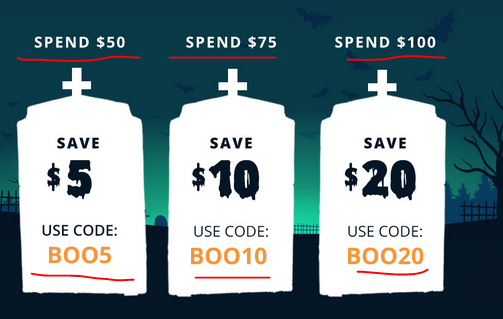 Just in time for Halloween, coupon code BOO15 gets you 15% off site-wide at Stacksocial. They have some online photography courses, software (a lot of it is for Macs), and other assorted photography/photographer six-degrees of separation items (cloud, VPNs, design, WordPress themes, etc). This is a limited time coupon offer. Good until around 8pm Eastern (give or take), coupon code SURPRISE will get you a discount at Stacksocial that is randomly selected to be one of these five amounts: 5% off or 10% off or 15% off or 20% off or 25% off. They have a variety of photography courses, along with the big Lytro Illum camera (reminder Lytro is out of the consumer camera business). Due to time constraints I can’t price check items right now, and the coupon will expire by the time I get around to doing so, so this is a DIY adventure. Stacksocial has a Parallels 11 for Mac promotion. Its price is $80. But if you purchase an additional $30+ item, and enter coupon code PARBUNDLE, it will take $30 off the price, making Parallels 11 a $50 item. Your shopping cart total must be $110+ (before taxes/fees) before you enter the coupon. The coupon will drop it to $80+. From the Impossible Project, the Polaroid 600 Camera is bundled with one Color Film Pack (eight exposures) together for $130 with free shipping at Stacksocial with a limit of three bundles per customer. PS: it is interesting to go back and forth between digital and instant, where you can take near infinite pictures without additional cost, versus paying additional money for every exposure. This could make an interesting photography essay/exploration for someone to write! The non-PRO version of Corel’s latest AfterShot 2 software (aka the “Standard” edition) is available for $10 as a digital download for PC or Mac or Linux at Stacksocial. They only carry the non-PRO version. PS: if you are planning to buy a camera from Adorama, keep in mind that a number of the Adorama bundles for select dSLRs, mirrorless and serious P&S cameras come with a Corel software bundle that includes the PRO version of this and PSP too. Stacksocial is offering the HDR Projects 4 software for either Mac or PC (select from the TYPE dropdown menu your choice) for $29. This is instant digital redemption, all sales final. The license is lifetime but updates are not included. The terms also say redeem within 30 days of purchase. Check the listing for all the details. Stacksocial is back with another Adobe-centered training course bundle. This one is offered by the “Live Photo Academy” and it is a four course Adobe Digital Photography Training Bundle going for $29 with instant digital redemption but no returns (all sales final). The four courses are Lightroom, Photoshop, Photography and Graphic Design and Creative Suite. They will be available live or you can watch them later on-demand. Details on the four courses over there. Speaking of Stacksocial, their Spring 2016 Pay What You Want Apple MacOS bundle continues, with $1+ getting you the Emulsion App or if you beat the average $15.50+, you get 10 more software titles, including Corel’s Aftershot PRO 2. For Mac Users, Spring is in the air, and so is the Spring 2016 Pay What You Want Mac Software Bundle at Stacksocial. If you pay $1+, you get three software titles which include the Emulsion digital photo library app. Click on “View All Products”, it’s the last one in the long list. If you meet or beat the current average price of $15.48 (may change slightly over time), you get a total of 13 software titles, the three above, plus ten more, which include Corel’s Aftershot PRO 2, along with Owlet (photo realistic 3D Models), and various other computer utilities (files, security, music, etc). If you are interested in learning more about Adobe’s various software products, Stacksocial has a 14-course Adobe KnowHow All-Inclusive Photography Bundle offered for $69. These courses stream online and you have lifetime access to them. You must redeem the promotion within 30 days of purchase. The bundle has three Lightroom*. * courses (Mastery, certification exam prep, Crash Course), general photography classes, specific photography classes (flash, studio, wedding, B&W, night), and more. You can watch them in any way and order as you like. All sales are final. You can redeem them right away. 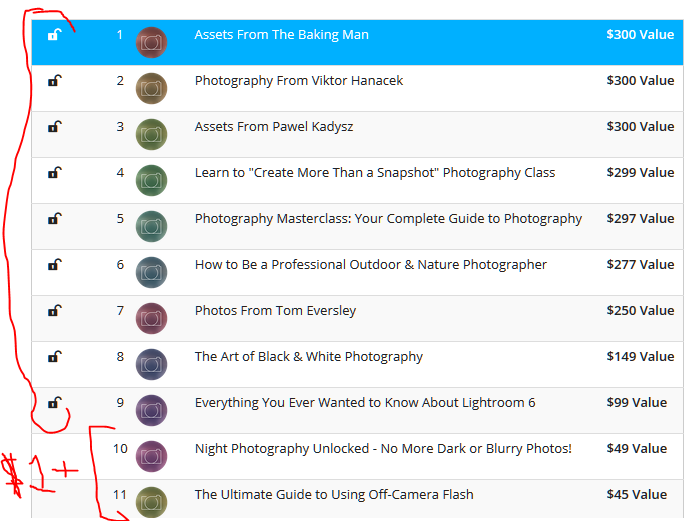 On the other hand, if you want to pay less or get fewer courses, the Pay What You Want Bundle gets you two courses if you pay $1+ (night, off-camera flash), or if you meet/beat the average price (currently $19.50), you get 11 total courses and assets (the previous two plus a cornucopia of photo-related courses). Assets as in downloadable graphics and other related digital files. Speaking of “Pay What You Want”, they also have a Design Bundle bundle that gets you eight different font sets if you meet or beat the current average price of $10.08.